Laser Diagnosis Laser Dentistry allows us to provide treatment that is completed more efficiently and with added comfort. The dental industry is always advancing; many treatment materials continue to improver and most importantly the technologies that allow us to provide your treatment are in constant progress. With Laser Dentistry Takapuna Dentists can provide highly effective and comfortable treatment easily and efficiently. Diagnodent Laser for Detection of Decay Our Diagnodent Laser is a scientific instrument that plays an significant part in our preventive care program. This is 98% accurate, fast and painless. As a non-invasive tool that helps us to accurately diagnose weakened or decaying tooth structure and treat problems early. Advance diagnosis enables us to prevent the further spread of decay and for minimally invasive dental treatment methods to be used. 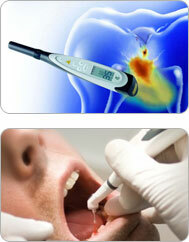 Laser diagnosis is the mainstay of our comprehensive diagnosis and is the Gold standard of Oral Care.